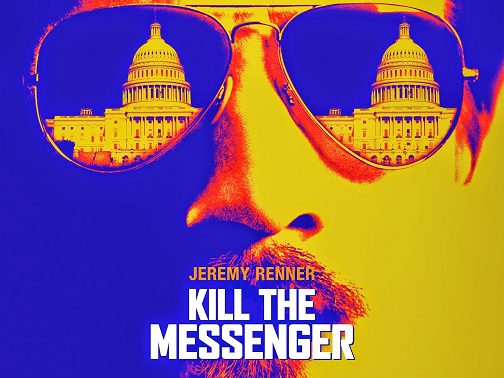 Kill The Messenger is based on a true story about the American government who were exposed in dealing with the importation of cocaine to help fund the CIA's operation in Nicaragua, Central America. Gary Webb [Jeremy Renner] a Pulitzer Prize award winning journalist with the Mercury News Tribute blows the lid of this scandal after a meeting with the wife of drug dealer Norwin Meneses who was due to face trail. She gave Gary Webb a transcribed document from the US Department of State conversion about these cocaine deals on behalf of the CIA operation in the Central American country. Since the fall of the Cuban President Fulgencio Batista's rule in 1959, which led to Castro and the Communist gaining power, American foreign policy was to quash any communist uprising or socialist political parties from gaining power in basically America's backyard. During the 80's Communism or extreme left views was gaining power in Nicaragua and America decided that they had to be stopped, so through the CIA the political parties and paramilitary groups most famously The Contras were funded to fight the Marxist Sandinistas regime. To help fund these expensive anti-Communist operations and projects they needed some serious money. Americans thirst for cocaine had skyrocketed since the late 60s and 70s that it would make the vast amounts required to keep Communism and the old Soviet Union [USSR] from gaining any more land in the Americas, as Cuba was more than enough held in Communist hands and supported by arch-rivals the Soviet Union now Russia. Unfortunately while Gary Webb thought he had a story of mass public importance and credibility, taking on the American government especially the CIA was to have a disastrous effect not only on his career but also on his family. The American government sought to discredit him and his documents of the CIA and American government's involvement in importing millions of dollars of cocaine in its pursuit of fighting communism in Nicaragua. While this tactic worked against Gary Webb, it was years later that the truth eventually came out about the CIA's involvement in cocaine trafficking in a 400 page CIA report acknowledging their involvement and operations at that time in Nicaragua. Gary Webb wrote a series of published articles about his findings, which eventually was made into a book called Dark Alliance: The CIA, The Contras, and the Crack Cocaine Explosion. Nick Schou wrote Kill The Messenger: How The CIA's Crack-Cocaine Controversy Destroyed Journalist Gary Webb, which this film is based on.